Brewery Profile: Tilted Mash Brewing Co.
Our charismatic Taproom Manager at Tilted Mash Brewing. Embracing his new role since July 2016, Kyle arrived into the Tilted Mash Family with a flashy smile and a passion for beer. Kyle comes to Tilted Mash with a background as varied as those of its founders. In 2002, Kyle accepted a position with UPS as a heavy equipment operator, and was promoted to graveyard supervisor in eight short months. Kyle's stay at UPS ended when he was given the opportunity to enter into the bio pharmaceutical field as an equipment and logistics specialist. For the next decade he worked with global giants in the industry such as Genentech, Amgen and Boehringer-Ingelheim. Kyle became a jack of all trades, holding positions such as heavy equipment specialist, level 1 HazMat responder, hazardous shipment lead, international finished product shipper and warehouse manager over the course of his career. In the Summer of 2012 , Kyle married his long time Party Buddy, and secret crush, Terryn Ormonde. Thus ending a nearly 18 year stretch of being in "the friend zone". With his new bride in tow, Kyle then did the unthinkable. He packed up his bags and left the shipping industry all together in order to pursue another dream--BEER! Kyle embarked on his new endeavor as a food server and beer tender at a local Sacramento beer bar. Kyle quickly expanded his knowledge base and was promoted to Beer Buyer & Manager. During this short time he also acquired his Cicerone certification as a Beer Server. Now at Tilted Mash, Kyle is excited to combine his love of both logistics and hand crafted beer. He is still excited to be the server that greets you and pours your pint, but also looking forward to meet the TMB warehousing needs as the brewery evolves and expands; and is looking to add Assistant Brewer to his extensive resume. Introducing the team behind Flatland Brewing Company. Joining owners Andrew and Michelle Mohsenzadegan are Mack and Sean. Mack (left) joined us as the first official tap room employee. He's been a great addition to the team. Look for him on Thursday and Sunday! Sean (second from left) is the taproom manager, brother, and handyman here at Flatland. His journey has been fast, and he's settling in quite nicely in the industry. Owner and brewer Andrew is the brains behind both the business and the brewing. This year marks year 10 of brewing for him. Co-owner Michelle coordinates many of Flatland's events both at the brewery and throughout the community. Together, the team at Flatland Brewing Company is passionate about sharing their collective love for craft beer with the community of Elk Grove, as well as the greater Sacramento region. 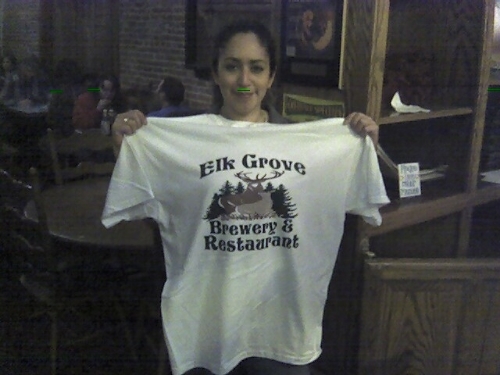 With Elk Grove's first brewfest right around the corner, we thought it was a perfect time to pay tribute to Elk Grove Brewery. It was located in Elk Grove's oldest building built in 1885 located at 9085 Elk Grove Blvd is now home to Lola's Lounge. 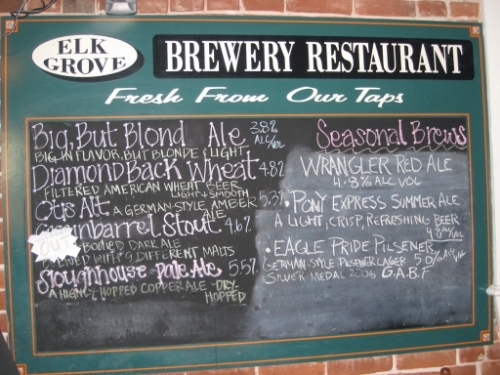 Elk Grove Brewery opened in 1995, founded by Dave and Kathy Ogden, then sold to Chris and Tammy Correa in 2003. Fun fact: Tammy waitressed under the founding ownership. The brewery closed in 2008. 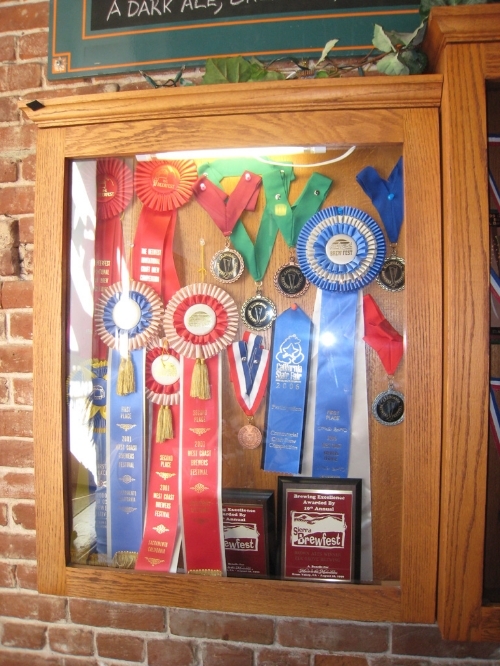 The brewmaster, Bill Wood, won a slew of prestigious awards for his brews. 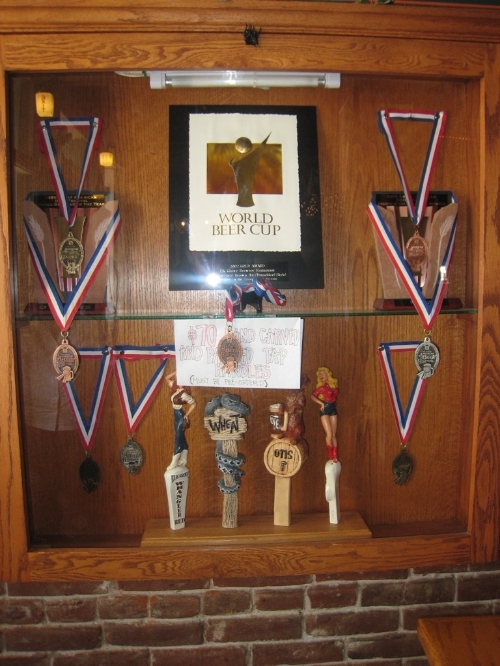 In 1999 the brewery won Small Brewpub of the year. Check out the complete list of awards. The list is five pages long. After the brewery closed Bill Wood brewed at Auburn Alehouse and now is brewing at Lodi Beer Company, check out the video below. "My brewing career started with home brewing in my brothers garage in the late '80s. We brewed many styles of beer, but our favorites were our Alt Bier ("Alt! Who goes there! "), Porter ("Goat Scrotum Porter") and Vienna Lager (it was too good to name). At the time I was working as a field technician for a local Geo-technical Engineering firm (Raney Geo-technical). Having had a great success home brewing and after completely digesting Charlie Papazian's "Joy of Home brewing" (a book I still use today), I realized that brewing professionally was something I really wanted to do. My goal was to attend the Brew Master program through U.C.Davis Extension program. In order to apply I had to fulfill some prerequisites at community college (Sacramento City College). During this time my brother, who was living in Elk Grove, heard that a brewery was going in at the General Store Building. I went in, filled out an application and met Dave and Kathy Ogden, the original owners. Dave was also interested in brewing and hired me as a bartender/ server with the idea that I would help with the brewing as needed. Soon Dave realized that running the restaurant was a big enough job and that I seemed to actually know what I was doing. In the beginning we did not brew that often so I caught hours bartending, serving and cooking. Within a year I was getting most of my hours brewing and had stopped going to school. Working as a brewer was education enough! 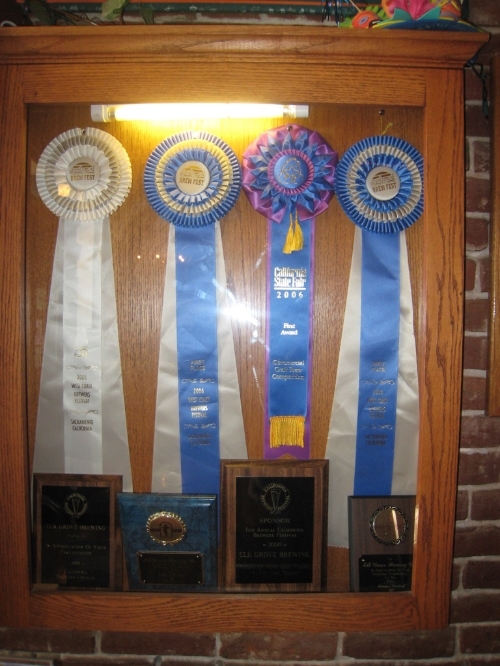 In the Summer of 1996 we won our first award, a 3rd place for the Big, But Blond at the CA state fair. And the rest , as they say is history!" Digging through the internet archives I found a description of their staples. Big, But Blond: Big in flavor, but light and blond in color, this is one of our most popular ales. An easy-drinking brew that is clean, crisp, and light. 3.8%Alc./Vol. Diamondback Wheat: Not to be confused with a Hefe Weizen; our filtered wheat ale is very refreshing and smooth. Brewed with 60% wheat malt, this brew has a malty-sweet finish. 4.8% Alc./Vol. Otis Alt: A German style amber ale, this beer is brewed with imported German hops that lend a distinct hop character not found in many beers. The amber color comes from the use of German-style malts which have a lightly roasted malt flavor. 5.3% Alc./Vol. Sloughhouse Pale Ale: Brewed as a tribute to the hop fields once found throughout the Sloughhouse area, this copper-colored ale is well hopped. With a floral hop aroma, moderate hop bitterness, and a balanced malt body, this is a beer made with the craft beer drinker in mind. 5.5% Alc./Vol. The brewery is said to be haunted and made a mention in a book titled HPI Chronicles. Here is a quote from the book: One of the employees said she was grabbed at the waist by a ghost with a strong grip, she suspected it was a male entity. In the ladies' room strange creaking noises have been heard. One of the weirdest experiences is when a female patron went into the lady's room, she saw eyes staring at her, when she frantically left the lady's room, the eyes followed her out to the bar. Some employees feel like they are being watched. Some employees say that they have seen moving darting shadowy figures. Elk Grove Brewfest is returning for another year, and with an ever growing craft beer scene in Elk Grove, it's high time that the city had an annual Brewfest. EGBF sold out last year, so don't wait to get your tickets! Elk Grove Brewfest will take place in Old Town Elk Grove at Old Town Plaza on Friday, May 26th, 2017 from 6-10PM. The event is brought to you by Beers In Sac, in partnership with the City of Elk Grove, and will be benefiting Elk Grove’s own, the Runnin’ For Rhett Foundation. Elk Grove Brewfest will feature 50+ breweries, cideries, meaderies, and a few wineries, with local gourmet food trucks, vendors, a cigar lounge, and live music and entertainment. Come and take in the sights at Historic Elk Grove and join us for a night to remember at this community focused and inspired event. Must be 21+ years old to enter.